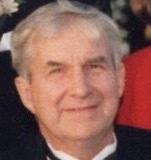 William Alexander Johnston, Jr. 86, of Norwell, died March 17, 2019. He was born April 20, 1932 in Boston, MA, son of William “Bud” Johnston, Sr. and Eleanor Johnston of Randolph, MA. Bill served in the U.S. Navy during the Korean War as a communications officer aboard the aircraft carrier, U.S.S. Antietam. He graduated from Boston University in the class of 1959. On April 20, 1962, he married Melissa Jane Hill in Malden, MA. He leaves his four sons, William A. Johnston, III of Halifax, MA and his fiancé, Erin Fahey; Christopher H. Johnston of Hopedale, MA and his wife, Robin; James I. Johnston of East Freetown, MA and his wife, Kathleen; and Douglas S. Johnston of Newton, MA and his wife, Jessica; and eight grandchildren: Nick, Doug, Alex, Holly, Max, Rachel, Grace and Sarah. He also leaves his sister, Patricia Dorr of Randolph, MA; his nieces Melissa Whitehouse and family Hal, Lily and Luke Whitehouse of Milford, MA, Amanda Lind of Hopedale, MA, Margot Anderson of New Orleans, LA, and Heather Lutz of Simpsonville, SC; his nephew Jonathan Dorr of Mendon, MA; and many longtime friends. Bill found joy in the connections he made through work and leisure. As a hotel manager and bartender in college, and then as a salesman for most of his career, Bill developed a keen ability to find common links with people from all backgrounds. Conversation came easily, especially if the topics included dogs, boats, politics, and his family. He loved the ocean and was a lifelong member of the South River Beach Club and commodore of the Satuit Yacht Club in Scituate. Dogs of all kinds were his constant companions — whether on long walks through Norwell, or trips to Humarock — earning places in family lore for their adventures on land and sea. Bill was a proud father and friend, serving as a scout master, soccer coach, sailing instructor, sales mentor, and skipper of the sloop Scout. His wife of over 50 years, Melissa, was the most precious thread throughout his long life. Visiting hours will be held 4-8pm on Thursday, March 21st at McNamara-Sparrell Funeral Home in Norwell, MA. 02061. A private family service to be held at the U.S. National Cemetery in Bourne, where Bill and Melissa will be peacefully laid to rest together on Friday, March 22nd. In lieu of flowers, donations in Bill’s memory may be sent to: Harbor House, 11 Condito Road, Hingham, MA.